You are here: Home / Foot Care Blog / Shoe Odor / Can I Wash Stinky Shoes In A Washing Machine? What Do Washing Machine Manufacturers & Technicians Say? Rinse the shoes with water. 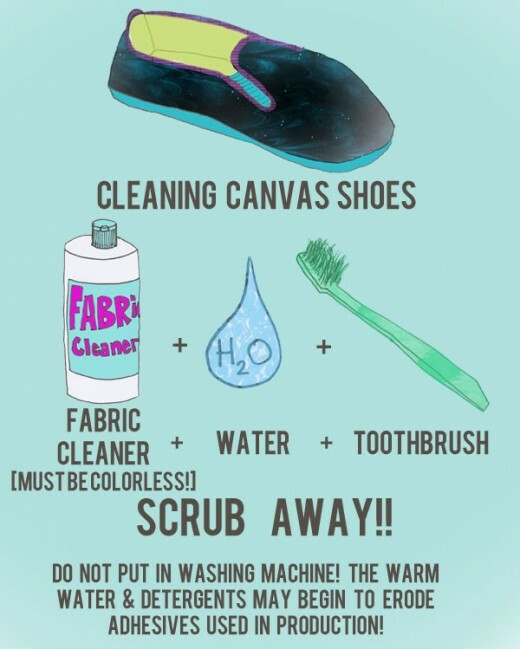 Use a neutral cleaner to soft brush the shoes. Avoid using bleach or harsh chemicals. Rinse the shoe with clean water. Allow sufficient time to dry, stuffing with absorbent white paper to keep the shape. Wash shoe laces with the regular laundry load. What Do Shoe Retailers & Manufacturers Say? ASICS says you can remove the sock liner or insole and machine-wash that, but they do not recommend washing the entire shoe in a machine. Instead, clean off surface grime with a toothbrush, they advise, and use a little warm water with an anti-grease soap. Even TOMS canvas shoe manufacturer recommends hand-washing. However, several fans of the shoes say they were able to machine-wash their shoes without incident. To do so, you should remove all loose dirt with a bristle brush, wash on cold, throw in a small amount of gentle detergent halfway through the cycle, and ensure that the shoes are completely air-dried before putting them back on. We’ve seen all sorts of wacky advice about shoe cleaning — from putting your shoes out in the sun “to prevent bacterial growth” and sticking them in the freezer, to steam cleaning in the washer and putting cat litter into the shoes. Yuck! Simply put, the reason your shoes stink is that they are sweaty and covered in a colony of bacteria. So, if you dry the shoes out and eradicate the bacteria, your shoes will be much, much sweeter smelling. 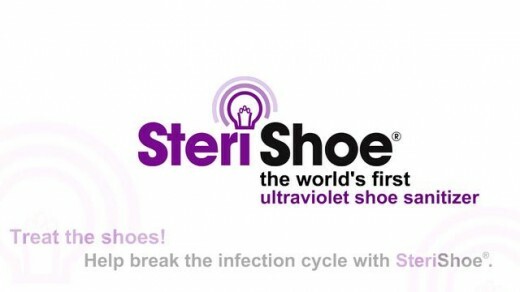 The SteriShoe UV light shoe sanitizer is the only clinically proven way to eradicate 99.9% of the odor-causing bacteria in your shoes. A 45-minute cycle each evening will ensure that your shoes stay as fresh and hygienic as possible. We also recommend that you rotate shoes every other day to allow for proper drying time. You’ll still need to brush off the exterior of the shoe, but at least you won’t have to live with the stigma of stinky shoes any longer! This is nice washing machine information blog. Thanks for Sharing. I could understand shoe manufacturers cautioning against this “IF” they have tested and proven that popular detergents can and will degrade any part of the shoe (ie stitching, leather, or adhesive). Everyone else is just jumping on the band wagon. I and countless others have tossed shoes in a washer without incident. Place in gentle cycle, remove laces and insole and wait. Also, the only 2 reasons I don’t use the dryer to dry them is that they bang around and they tend to push the door open at times. But I have tossed rubber soled slippers in there. Aside from that, Wash On! This is not a blog. Just an advertisement. By definition, a blog is “a personal website or web page on which an individual records opinions, links to other sites, etc. on a regular basis.” We come right out and say that we manufacture a UV light shoe sterilization device. Our blog is a means of promotion to connect with people who might benefit from the product. However, being in this business, we also read a lot about cures for toenail fungus, diabetic foot ulcers, smelly shoes and bacterial infections. So we like to share that information with people as well. Sorry if you were offended. Is Laser Nail Fungus Removal Worth The Money? Can Garlic Treat Athlete's Foot?